Over on this thread I started thinking about the feasability of a 12-string Jag. The advantages of doing this as a DIY project are 1. shorter scale length than a standard Fender XII, 2. Jags have a bright, jangly sound that I think would work well for the 12 string sound and 3. I still don't own a Jag. The main issue is a 24" 12 string neck. Warmoth could do it, but it's an expensive proposition this side of the pond. That's the biggest hurdle I think. A compatible bridge is tricky...a Danelectro style unit could work, but something like this looks more substantial, and is more Fender-y. From the pics, it looks like six of the strings are top-loading and six are through-body. A neat solution, even if it does potentially involve some drilling. I just tried googling for hardtail Jags, and they're surprisingly rare. Perhaps a Squier Affinity Jazzmaster HH body, with a Jag pickguard and circuitry swapped in, might work? Oddly, I've never really thought about the differences between JMs and Jags as far as the body dimensions are concerned; I always assumed the bodies were identical, even if the necks and everything else apart from the bridge and tailpiece were different. Buy a Revelation 12 String JM copy. There's probably enough room on the Jag headstock's underside for 4 more tuners. Just do an 10 string! I dunno about extra machine heads on a standard neck. There's the possibility of doing a "conversion" where you somehow find room to drill some extra holes into a standard headstock, and still have room for the tuning keys to turn. Assuming the nut is wide enough. I read one thread where someone emailed Warmoth, but it seems that their 12 string necks use a specific type of truss rod design that I assume is only made for standard scale. I'm gonna send an email out to a couple of UK-based luthiers to see whether a one-off custom job is feasible. The neck may well cost more than the rest of the guitar combined, but it might be the only way. Yeah, that's pretty steep, but to be fair the Gotoh hardtail design isn't much less than that. Plus, it's a very neat and tidy way of converting a Jag body with the standard tailpiece rout and no extra drilling. It does the job while keeping the classic look. I kinda like it. the Gotoh hardtail design isn't much less than that. 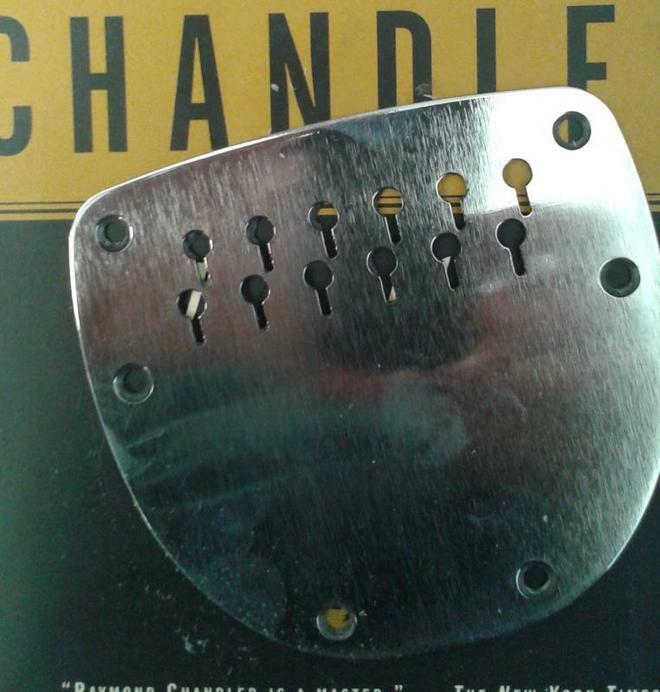 I've thought of drilling a jazzy tailpiece for 6 extra string anchors to get a working 12 string tremolo. Can't be arsed to do it, but for what it's worth, my research indicated it's definitely easier and cheaper to go 25.5" scale. Cooterfinger can probably make a neck? If my next project isn't another kit (depends on job situation) I'm tempted to embark on a seven string Jazzmaster, but I really want a proper Jazzmaster tremolo. Check out the ESP/LTD XJ-12. 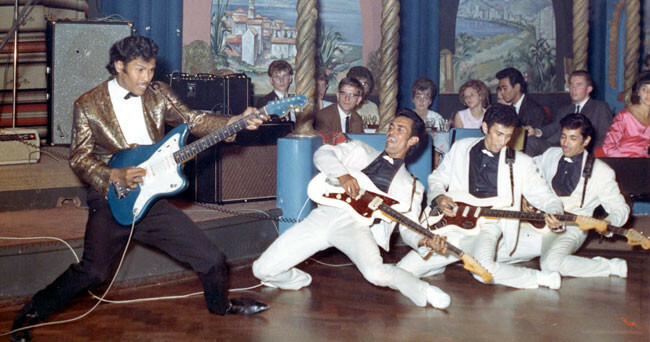 They was a 60's surf band and they used a modded Jaguar like that. Cannae remember if it was 9/10 strings though. Or what they were called. It was an Indo-rock thing - scroll down a bit here. Best part is little Johnny Lydon in the back, watching and learning. 10 string? Like this thing from Sonic Youth? Maybe. The repair/luthier who got back to me with something vaguely hopeful (the other one sent a one-line reply that simply read "we can't help, sorry!" with no further elaboration) reckons the standard Jag nut is a bit tight but, given that it's similar in width to a Rick, ought to be okay. Similarly, the string tension shouldn't be an issue. Which just leaves the headstock. There are "conversion kits" that put a second set of 6-in-a-line tuners at 90 degrees, running parallel but pointing downwards. It's another neat solution, but makes the headstock a bit crowded and I do worry a bit about what the extra holes might do to a Fender-shaped headstock. Structurally, I mean. That retro surf band look rad btw. EDIT 2: if this is what you were on about, yeah. It's mental. the standard Jag nut is a bit tight but, given that it's similar in width to a Rick, ought to be okay. Have you ever played a rick 12? I haven't but I understand they're a fairly unique proposition. Yeah, but I think I'd rather have the low E and A doubled instead of the two highest strings. I mean, aren't high E and B and their doubled strings on a XII tuned the same anyway, while the others have an octave difference?